But I guess I never really did describe some of the basic things like what BRANDS I use…So let’s talk components. 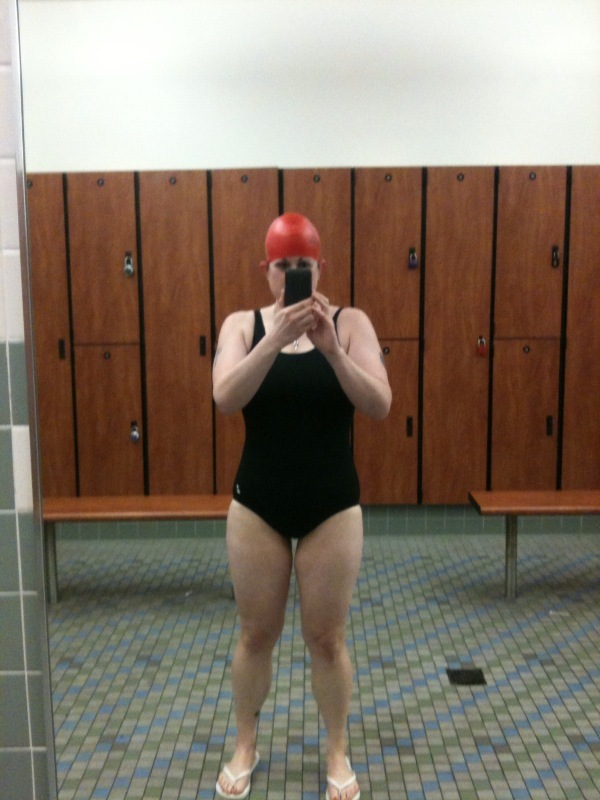 When I first started swimming again I used the cheapo suit I’d gotten at Target. I don’t remember the brand or anything but it quickly faded to being SEE-THROUGH after just a few weeks in the chlorine pool. I learned pretty quickly that there are types of swimsuits that are better suited for lap swimming. The above photo was taken about six months ago and about 5 pounds ago. As you can see it’s not faded at all. I buy my suits at Portland Swimwear downtown. The prices are just okay–nothing too great. The suit I have now was $80. I wish I could order my suits online for cheaper prices but I need to be able try the suits on first. As I lost weight I had to buy new swim suits because they no longer fit–not because they wore out. I buy a new swimsuit about once a year. The current one I have (above) is about a year old but it still fits great and it hasn’t faded at all. The only reason I’d consider buying a new one is because the inside lining is starting to come undone a bit. The above is similar to the suit that I own. It’s 100% polyester and like I said, it lasts forever and never fades. 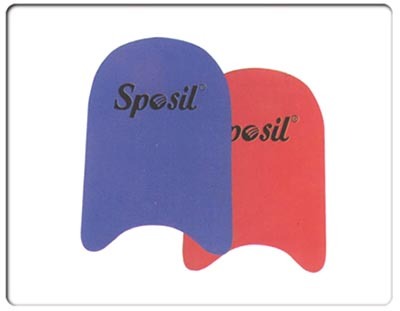 The polyester design is built to resist the harsh chlorine and it works! I also like this design because the clasp at the top doesn’t come undone. I’ve tried other suits that didn’t have a clasp and they tended to fall off my shoulders (especially as I lost weight). I was in search of the perfect goggles for a LONG time. I don’t know if I just have a weirdly shaped face but none of them fit properly. That meant they leaked. It drove me nuts. I’ve spent more money on goggles I ended up throwing out than I’d like to admit. For a long time I stuck with Speedo Goggles. I really liked the large, round ones because they didn’t leak. When those became impossible to find, I tried everything else out there. At REI one day I saw some goggles on the clearance rack and decided to give them a try. They were amazing! I’ve been converted! TYR Tracer Femme Metallized Racing Goggle are my new goggles. I’ve got a pair now that I use and I bought a backup pair for when they eventually wear out. They are smaller than I’m used to but it was a comfortable transition. And they don’t leak. They are shaded goggles, which came in handy in Arizona when I swam outside! So far they do not fog, either. 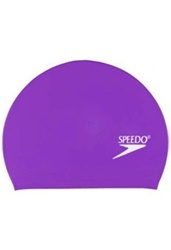 I use the cheapo Speedo latex swim caps. They run from $3-6 depending on where you buy them. Why do I buy the cheap ones? Because I replace them fairly frequently. They stretch out, they rip, they tend to get moldy if they sit in a gym bag wet (ooops). I’ve tried the Silicone caps, which are more expensive, but I found that they slipped too much. I do recommend a Pull Buoy. It’s excellent for training and developing your shoulders and upper body when swimming. It’s also great for beginners who are trying to learn how to do the Front Crawl but are having a hard time putting the kicking and arms and breathing all together. It will also help you learn what proper alignment is when you’re swimming. It will assist with learning the rhythm of breathing as well. It really is a beneficial little tool and whenever someone says they struggle with swimming this is the first thing I suggest they buy. Earplugs! A must! I go through a lot of earplugs with swimming. They are crucial for lap swimmers I think because Swimmer’s Ear can be an awful thing to experience. I buy the generic Rite Aid or Fred Meyer version of the soft silicone ear plugs. You can get Swim Gloves for training. I’ve never found use in them, mostly because I already have Paddles and they do the same thing. 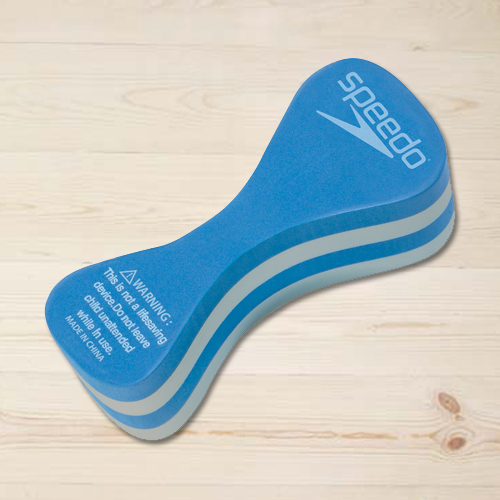 A kickboard is a good tool for when you get tired from doing other strokes but don’t want to just stand at the end of the pool. My controversial opinion on Flippers: useless. I think flippers are a crutch. They make swimming easy and that’s not why I do it. I swim for fitness and fun, not because it’s easy. 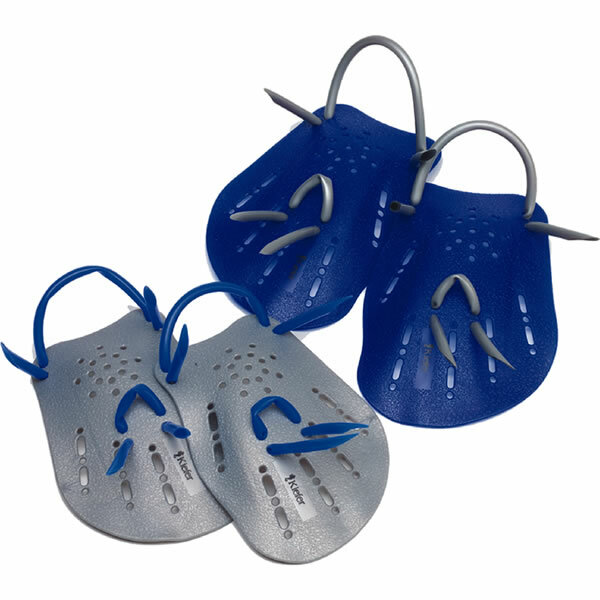 Some websites claim that flippers help develop leg muscles (swimming does that, I don’t need flippers to do it) and that they increase ankle flexibility. I’m not sure about that one either because I’d have ankle pain after using flippers too much. If you want to try flippers, go for it. It’s an individual preference and I don’t like them. Finally, I suggest buying a heart rate monitor for fitness. A HRM is especially helpful with swimming because it’s such a difficult activity to estimate calories burned. I use a Polar HRM that runs about $90-100. It’s the best fitness tool I own. QUESTION: Feel free to ask me anything about swimming! It’s a topic I love to talk about and in case you are a new reader, it’s actually how I lost my 100 pounds! I think I may buy a new suit just to motivate myself a little bit. I have some suits that would work, but they don’t fit well and are really uncomfortable. If I buy it, I have to go! Yay! Glad I could motivate you to try swimming. I love it. I think it’s a great sport (especially for runners who are injury-prone). Make sure your swim suit is at least 80-100% polyester so it last longer! I can’t get my Polar HRM to read my heart rate under water! It always reads zero, or it is completely off (like at 180, when I’m just standing at the end of the pool.) Do you have any ideas about placement, etc. to make the HRM work under water? Oh that’s weird! Is the chest strap tight enough? I never have that problem when I swim with mine. This is perfect timing for this post. I am still on fence of starting swimming again and now I have no choice!! I have all that I need. A swimsuit (I got a Speedo last year for summer and it fits great), a Speedo cap, goggles (they are a little old but they stil fit) and the silicone ear plugs. So no holding back now! Good for you! It’s such a great whole-body workout. Hi Lisa, I actually have a question about the heart rate monitor. I’ve recently been thinking about getting one, and read up on them a little online. It said that you need to use a chest strap? How does that work? Does it go over your chest or just below? I weigh about 220-I’m worrired if it will even fit me? is it uncomfortable to wear? I guess that’s more than one question! Thanks for your input, and thank you for your honesty in your blog-you inspire me every day!!!!! Doesn’t your gym supply the buoys, kickboard & flippers? I’m glad mine does, but I defiantly would invest in a kickboard if it didn’t. Yea, I bought a Nike swimsuit in January that didn’t fit me by March. I think it was cheaply made and stretched, and maybe I lost weight too, who knows, I don’t keep very good track. I would have never thought there was so much thought to put into consideration for a swimsuit! My gym has kickboards but not buoys. I own my buoy and paddles.